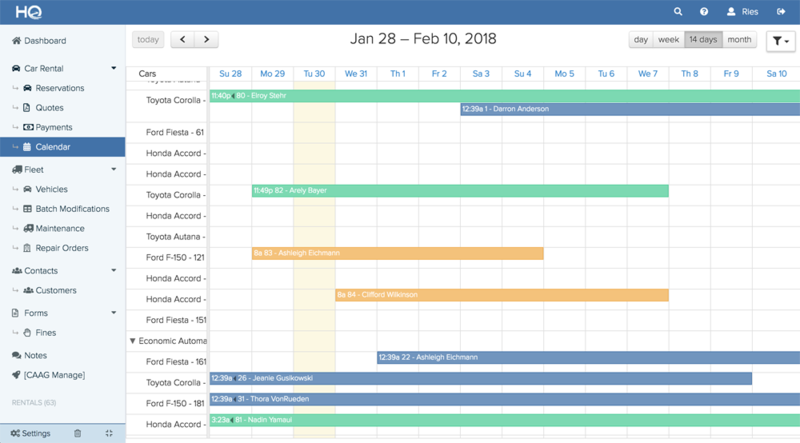 This page is an overview of all your reservations in a form of a calendar. We break the calendar down into the different vehicle classes and then by the vehicles themselves for an easier view. You can toggle the calendar to show time period of one day, one week, 14 days or one month. You can find the buttons on the top right of the page, highlighted in orange, in the picture below. How to filter the vehicles classes? 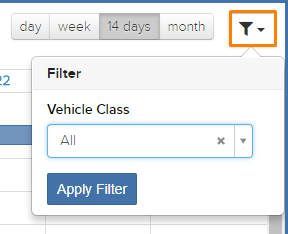 You can filter the calendar to show specific vehicle classes with these steps. Firstly, click on the filter icon on the top right of the page, highlighted in orange in the picture below. Next, choose the vehicle class from the dropdown list labelled vehicle class. Lastly, click the blue “Apply Filter” button. How to create a new reservation from the calendar? You can create a new specific vehicle reservation from the calendar, just click and drag your desired dates in the line of your desired vehicle. The example above, highlighted in orange, will create a new reservation for the vehicle Ford Fiesta – 221 for the dates of 14th of February to the 18th of February. It will automatically redirect you to step 3 (Extras) of the reservation process and use your company’s default time for pickup and return. To learn how to make a new reservation from step 1, click here.